For the 2018 Layout Tool Swap I chose to make an assortment of items. Since I haven’t used many layout tools outside of a square and pencil I wasn’t sure what was useful and what wasn’t. I also was at a loss for making appropriately proportioned tools. Fortunately, there are plans and parts kits available for all of these items. I took full advantage of them. This was also my first exposure to working with brass. I found out that there are numerous places online where you can get brass for reasonable prices. I also found out that brass isn’t overly difficult to work with in a wood shop as long as you are careful and think through what you are going to do. I relied quite heavily on the experience of other guys in the swap that had metal working experience. It is always surprising how much knowledge there is on LJ about so many things and how willing everyone is to share their knowledge and experiences. Before I get into specifics, I’d like to put in a pitch for the 2019 Spring Mystery Swap that will start mid January. Swaps are a great way to try new things and meet some great folks. Watch for details in early December on the Forum Board. 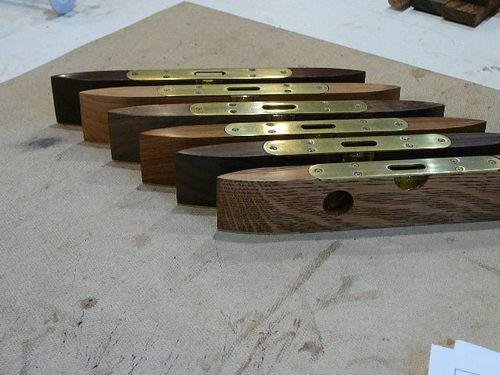 8” Torpedo Level: Body – Brazilian Ebony. Schlabaugh and Sons has plans and brass parts kits. 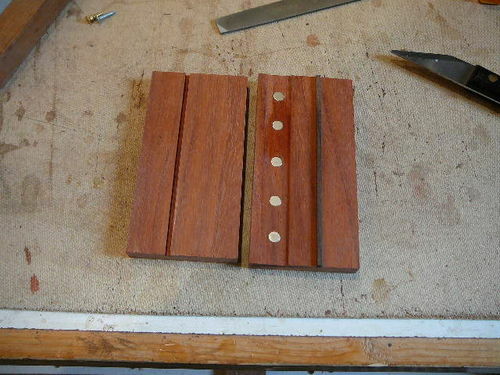 Marking Gauge: Body – Bloodwood. 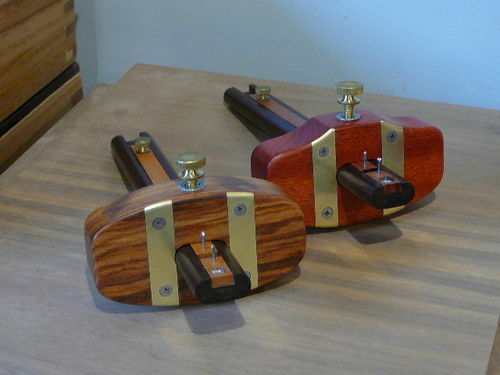 Beam – Katalox with Bubinga inserts. Schlabaugh and Sons has plans and brass parts kits. The brass strips aren’t on the original plans. They were added to provide a more durable work face. I made a couple of these in case something went wrong. The Granadillo version developed a crack across the top part way through the project. 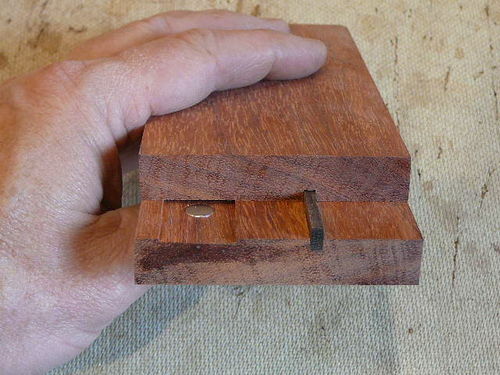 Rectangular Layout Gauge: Body – Paduak. Knob – Cocoblo. Ruler – 6“ Starrett held in place with magnets. Plans came from Woodonline.com. While it looks like just a couple of 6” pieces of wood with a ruler sandwiched between them, there is more going on here. The ruler is held in place with rare earth magnets which allows the user to adjust the ruler flush each time it’s used. There is also a key that runs the length of the tool to ensure the pieces stay square with each other. Finally, the knob and slot on top also keep things square and provide a means of tightening everything up so it doesn’t move. This is a really solid layout tool. Circle and Straight Layout set: Body – Bocote. The plans came from Woodsmith Plans. The circle layout gauge is quite clever. One side is for inside circles and the other side is for outside circles. 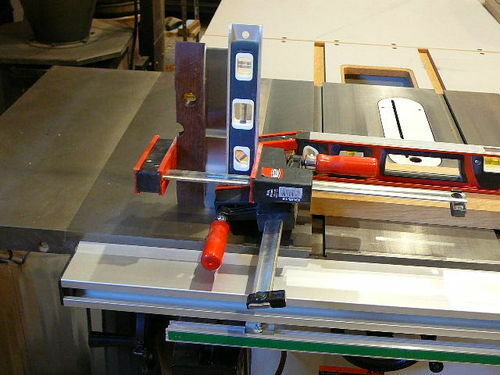 The straight layout gauge should be useful on smaller projects. The countersunk holes work well with a 0.7 mm mechanical pencil. All of the wood was finished with sander sealer and Arm-R-Seal and sanded to 2000 grit then waxed and buffed. Some beautiful pieces Earl! Excellent job on fitting the metal, they all look like classics. Super Nice Items. Great work congratulations. For a guy who doesn’t know much about metal, you sure could have fooled me! These are beautiful Earl – and I especially like how you always go overboard by making LOTS of them! I really enjoy showing my dice hammer off to all my friends who stop in and I do have something in the works as a Thank You present. I agree…very well done and professional looking tools. These look like something that was found in the antique Studley Tool Chest. Superb work Earl! Everything is really functional as well as beautiful. Congrats! Your tag says 2019 layout tool swap! Are you volunteering for that one too? Earl. Nice set You definitely went over the top. Any one piece would have been great for a swap item. Thanks for posting, and congrats on the 3. Mike – thanks for telling me it is still 2018. My proof reader is blind as a bat. earl are you a professional tool maker because they are surely top notch my friend.i especially love your layout gauges,just beautifully done.and cant say enough so ill just say thank you for sharing this. Beautiful tools and great to see some of your inside secrets. Count me in on the Mystery Swap. Stunned is a pretty good description, for a guy who says hes never made one, or worked with the new material to you (brass). WOW. Simply beautiful, and pristine looking. Amazing job all around.